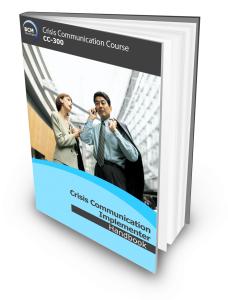 Crisis Communication Implementer or CC-300 is a 2-day intermediate Crisis Communication course with a two and a half hour, 100 Multiple Choice Question (MCQ) based examinations, following the successful completion of the course. This intermediate-level course is suitable for professionals assigned to support the crisis communication effort. Course participants should have prior knowledge and experience in Business Continuity Management (BCM), Crisis Management (CM) and/or IT Disaster Recovery (DR). Having understood the different types of organisational crisis scenarios from the foundation course, participants will be guided to take a examine their organisation’s current threats and potential crises. Participants would be guided to perform a stakeholder analysis and identify issues to develop an appropriate crisis communication plan to manage a crisis. If your organisation has a full-time or designated corporate communication professional, this course will assist his/her understanding of crisis communication issues that are linked to the various BCM, CM and DR planning efforts. This course is also beneficial for BCM, CC and DR professionals who need to support the organisation’s communication process during a disaster or crisis. CC Certified Specialist (CCCS) Certification will be awarded to participants who successfully completed and passed the Qualifying CCCS examination attached to the course, sends in an application detailing at least 1 year of CC experience , make the application processing fee payment of SGD75 and satisfies and meets the experience requirements of the independent certification body. Understand the activities and key deliverables with the CC planning methodology. Perform risk assessment to identify the possible threats and incident scenarios such as riots, supply chain disruptions and product recalls. This course is designed for Middle Management, Department Representatives, Business Unit BCM Coordinators; BC/DR and CC Managers. This course incorporates a 100-Multiple Choice Question electronic exam the next day. The duration of the examination is 2 and 1/2 hour. Candidates who achieve with a passing score of 75% or higher are eligible to apply for the BCM Institute’s Crisis Communications Certified Specialist (CCCS) accreditation. The examination fee is included as part of the course fee. SGD75 (Certification Fees are to be paid during application after participants has passed their Qualifying CCCS exam). This course fee includes the CCCS examination fee. Learn more about CC terminology and phrases via our BCM Glossary or BCMpedia. BCM Institute will conduct the course only if there are sufficient participants. BCM Institute reserves the right to alter the course content, alter the course location, cancel or reschedule course at any time without liability. In these circumstances, participants will be offered for deferment to the next run of the same course.